There are millions of crossword solvers who think they're pretty good. Now they have a chance to see just how they measure up to the toughest crosswords ever published in the "New York Times." The legendary "Times" crossword editor has combed through literally thousands of puzzles to collect the most diabolical mind-twisters he's ever published. "The New York Times Will Shortz's Extreme Crosswords" features a challenge like no other: a brand-new, never published Sunday-size puzzle that's more devilish than anything Shortz has ever worked on before. Solvers who correctly solve the completed puzzle will receive a "Master Solver's Certificate" from Will himself. 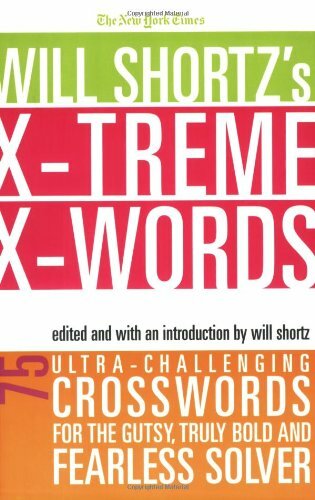 Features: *74 of the toughest-ever crosswords from the Times plus a giant bonus puzzle unlike any solvers have seen before*Edited by and with an introduction from Will Shortz*Follows in the footsteps of previous successful "Will Shortz"-branded crossword books.